Funding amount: AHRC stipend: for the academic year 2019-20, the stipend will be £17,559 with London weighting. This includes enhanced stipend to cover additional travel costs relating to the project. How did the relationship between the book and the human body change in the period 1350-1600? Considering English materials, this project investigates material and metaphorical intimacies between body and book across a key period divide, marked by the arrival of print technology, the Reformation and the ‘discovery’ of the New World. Wellcome Collection and Birkbeck, University of London, invite applications for a 4-year full-time or 7-year part-time Collaborative Doctoral Award to start in October 2019. 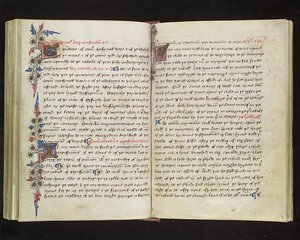 This unique opportunity offers privileged access to unrivalled holdings of Middle English manuscripts and early printed books relating to health, medicine and the natural world. Whilst these materials are acknowledged sources for histories of medicine, their literary and visual qualities are under-explored. This award also offers: supervision from world-leading scholars of early literature, medicine and culture; extensive research training (including conservation handling, research skills); experience in public engagement and academic knowledge exchange; and membership of vibrant intellectual communities at Birkbeck and Wellcome Collection. Birkbeck and Wellcome Collection are committed to equality and diversity and welcome applications and inquiries from all qualified candidates. Proposals which address sexuality, gender, disability or ‘race’ are warmly welcomed. A range of training opportunities are included in this offer which make it possible for candidates to apply from any relevant discipline, although some experience of reading Middle English is required. Applying candidates are expected to identify a focused research question within the broad area outlined below, building on their interests, expertise and prior study. The human body and the early book are intimate associates. The codex book is a format designed in relation to the body: the size of the hand that holds the book, the reading distance between hand and eye, and the book’s capacity to be carried on the person. Scholars have long appreciated the awareness that medieval writers on parchment had about the animal skins on which they wrote, linking a rich set of bodily metaphors directly to their material practice. This self-consciousness was ingrained enough to carry over into new print and paper technologies. How did changing book formats impact on conceptualisations of the body, and how did changing ideas about the body manifest themselves materially in books? This project’s aim is to explore diachronic change in material book production and consumption in relation to the body either side of the English Reformation. It will make new discoveries from Wellcome Collection’s unrivalled holdings of Middle English manuscripts and early printed books relating to health, medicine and the natural world. Although acknowledged sources for histories of medicine, these collections are still under-used in literary, cultural and visual histories. Wellcome Collection has intriguing examples of manuscript formats meant to be attached to the body or containing instructions for bodily rituals or acts. Equally this study could investigate the personal relationships between people and the books relating to the body which they owned, shared or borrowed, as evidenced in inscriptions, annotations and other signs of interaction. Manuscript and printed books materially incorporated attitudes to bodily markings, whether voluntary (cosmetics, tattoos, scarification, painting), inflicted (branding, mutilation, circumcision) or acquired (signs of age, birth marks, scars of illness, other disfigurement). How did representations of these change during the shift to print, or as the several ‘revolutions’ of the 1500s altered the discursive frames in which the body was understood? Bodies in books inform on the health and fortunes of the soul in the late Middle Ages. Ideas about the soul, and the relationship between body and soul, were disputed and disrupted in the sixteenth century. How might defacement and iconoclasm, annotation and tipping mark these shifts? What can the often very mixed contents of early books tell us about the relationship between religious and medical ideas? At Birkbeck, this student will be housed in the Department of English and Humanities, in the School of Arts. They will receive co-supervision from Isabel Davis and Susan Wiseman, who have international research reputations; their work, together, spans the period 1300-1700. Wiseman has published widely on women, metamorphosis and the material conditions of non-elite life and writing in the early modern period. Davis has a publication record extending from the Middle Ages across the Reformation, specialising in gender and sexual ethics in devotional perspective; her work has also taken on a medical humanities trajectory. At Wellcome Collection, the successful candidate will be supervised by Elma Brenner, the person most familiar with the relevant Wellcome holdings, and an internationally known scholar of Anglo-French medieval medicine and religion. Wellcome Collection has one of the world’s largest collections of Middle English medical manuscripts, with rich literary qualities, such as rhyming verse and translation/adaptation from Latin and European languages. They are complemented by an outstanding collection of late fifteenth- and early sixteenth-century printed books on, e.g., anatomy, surgery, gynaecology, and ‘popular’ medicine. The successful candidate will have access to this unrivalled collection, benefit from exceptional holdings of secondary materials, and have privileged access to staff reference files. The candidate will also have specific opportunities to contribute to Wellcome Collection’s wider research development programme, including public engagement opportunities, and to develop professional experience and skills beyond their academic pursuits. Birkbeck is one of the best places in the world to begin a career in early literature and culture. As part of the University of London and CHASE it is at the heart of vibrant scholarly communities. Birkbeck’s Centre for Medical Humanities, as well as its imminent Centre for Medieval and Early Modern Worlds, makes a ready intellectual home for this project. Geographically the college is surrounded by world-leading libraries, museums and galleries. The postgraduate community is large and students work together to organise events, publish, edit, curate, and contribute to public engagement initiatives, such as Birkbeck’s Arts Week. This studentship includes conservation handling training and access to desk space at Wellcome Collection; a taught MPhil programme at Birkbeck (research skills, critical theory, and teaching in higher education); and a rich menu of other research and training events at both. Birkbeck and Wellcome Collection are committed to equality and diversity. Birkbeck operates within national schemes such as Athena Swan, the Race Equality Chartermark, Disability Confident, Mindful Employer, and the Stonewall Diversity Champions Programme. Wellcome, the parent body of Wellcome Collection, recently made diversity and inclusion one of its priority areas. It is a Stonewall Diversity Champion and a member of the Business Disability Forum and Working Families. Applications are invited from all qualified candidates, and applications which consider questions of gender, sexuality, disability, or ‘race’ are warmly encouraged. The candidate will be expected to attend at least three supervisions a term (full-time) or two (part-time). These may be with all supervisors, or with individual supervisors. They will participate in Birkbeck English department’s taught MPhil programme and play an active part in relevant research communities, such as those within the college, the University of London, CHASE and Wellcome Collection. They will be subject to graduate monitoring at Birkbeck and will undergo an upgrade process, from MPhil to PhD (usually in their second full-time, or third or fourth part-time year). At Wellcome Collection the student will attend supervision panel meetings and conservation handling training. They may also contribute research to relevant Wellcome exhibitions, potentially also organising a public engagement event. The successful candidate will be expected to organise a two-day academic knowledge exchange event. A good or excellent result at BA and MA levels in a cognate subject area. Some experience of reading Middle English. A clear and interesting research proposal that fulfils the expectations of this topic. Language skills – higher level Middle English experience; Latin, French or other European languages. Experience of palaeography and codicology and of handling manuscripts and early printed books. Applications for this studentship must be made via the Birkbeck application form. The studentship is subject to UKRI eligibility criteria, and will cover home or EU fees and stipend at UKRI rates for a maximum of four years full-time, or seven years part-time study, subject to institutional regulations.